Susan was born in Salt Lake City, Utah, where she grew up loving the outdoors and the beauty of nature. Many vacations were spent camping with her family and exploring the western half of the United States. She studied Commercial Art and Advertising at Utah State University and continues to takes classes and workshops to expand her artistic skills. In 1996, she moved to Charlotte, NC and started Creative Art by Susan Nuttall, a company specializing in commissioned artwork incorporating oils, textured mix media, and encaustic paintings. Susan is currently living in Wilmington with her husband, David, where her paintings are inspired by photos taken during her many travels around the world. Susan's need to create heavy textured artwork started when her grandfather went blind. As a young girl she wanted to make art so that he could feel what she was creating. She would work in all kinds of different mediums to allow him to experience her artwork through his sense of touch. Years later when she was doing large murals she wanted to make them with more dimension. Susan could find no product on the market that pleased her, so she set out to perfect her own medium in hopes of creating paintings with the texture she envisioned. Susan has been using this self created medium in her art for over 20 years. 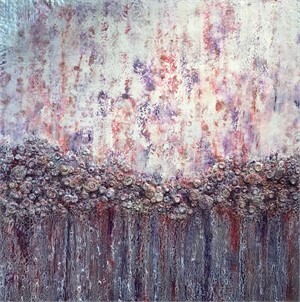 The process of creating Susan's textured paintings begins by working with her photos and her sketchbook. Once she finalizes the design for the painting, she starts with a pre-made artboard, layering the textured medium using an artist trowel or spatula. This can be many layers to get the desired back ground texture she envisions. Susan then adds the detail layers by hand sculpting each element to the background layers. After she completes the texture part of the artwork, she then makes her own oil glazes and starts the overlay process. Susan uses many layers of oils and varnishes to achieve depth in each of her paintings. After she is happy with the layers of glazes, she then finishes with small details of oil paints to achieve the final painting. The evolution of this creative process has both helped her to further develop her personal artistic style while satisfying her love of working with heavy textures in her artwork. Susan has won numerous awards, both regionally and nationally. 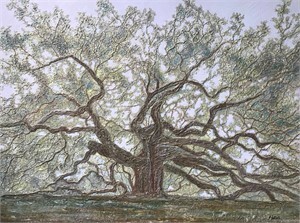 Her paintings can be found in public and private collections throughout the United States. Education: Commercial Art and Advertising, Utah State University Civil engineering and Design, University of Utah Continuing education classes: Illustration, painting, Ceramics, woodworking, Sculpture and design. Over thirty years of art, computer and design experience Exhibitions and Shows Solo Exhibit - C.H. Exhibitions Series Chapel Hill, NC - June, 2015 - Sept., 2015 "ALL Things Birds and Beautiful", Eastsound, WA - March 2015 - May 30, 2015 Solo Exhibit - Waxhaw Arts Council, Monroe NC March 2015-May 30, 2015 " Group show" All That Jazz - Coffee and Thompson Gallery, Charlotte, NC April 2015 Art of Southern Music, Belk Show, Charlotte NC Feb. - May 2015 Solo Exhibit - River View Gallery, Albemarle NC, March 2015 - April 2015 Group Show - Wake Forest Medical Center, Winston-Salem NC, Jan. 2015 - March 2015 Animal Planet - juried exhibition, Ciel Gallery, Charlotte NC Jan – Feb 2015 *2 nd place Art Exhibit - Cameron Art Museum, Willington NC Sept. - Feb. 2015 Bank of the Arts Juried Exhibition - Craven Arts Council and Gallery, New Bern NC., Oct – Feb 2015 "Call for Artist" Women’s and Children Hospital - Monroe, NC - Purchased 3 painting Oct. 2014 Tree Party - juried exhibition, Ciel Gallery, Charlotte NC Sept – Oct 2014 Judged Cornwell Center Show – Guild of Charlotte Artist, Charlotte NC June 201 The Art of Southern Music – Belk Museum, Charlotte NC May-Oct 2014 Winner of the Home grown mural project - Cornelius Arts Center, Cornelius NC Sleepy Hollow Masquerade ball and art exhibit - Gallery 27, Lincolnton 2013 National Juried show – Southern Appalachian Art Guild, Blue Ridge, GA *2 nd place Tossed and Found - Charlotte ARTery – Charlotte, NC Matthews Alive Art show – Matthews, NC 2013 *Colten Marble award “Intensity of the Hunt” Stanly Art Guild – Albemarle NC * Honorable mention “Barn Owl” Guild of Charlotte Artist – McDowell art show – Matthews NC St. Peter’s Episcopal Church – Charlotte, NC *Best in Show Raining Cats and Dogs – Charlotte ARTery – Charlotte, NC “Three month Solo show” Escape studio Charlotte “Eat & Drink Your Art Out” - Packard Place Charlotte NC Survey Charlotte Artist show - Ciel Gallery Charlotte NC Holiday Square Works - Providence Gallery Charlotte NC Solo Exhibit -The Art Station, 170 South Street, Gastonia, NC Solo Exhibit - Perimeter Gallery Center for the Arts, Rock Hill, SC Holiday show - Green-rice Gallery, Charlotte, NC Art Frenzy show, Juried show - Dalton Gallery – Rock Hill, SC Rowan Arts Council, Juried show - Salisbury, NC *Best in Show Solo Exhibit - Green-rice Gallery, Charlotte, NC Southern Appalachian Guild National, Juried show, Blue Ridge, GA *3 rd place “Commemorating Pit Bull Awareness”, Mebane, NC “Pet Fancy” Juried show, Island ford art, Statesville, NC “I am Woman” Juried show, The Next Picture show Gallery, Dixion, IL *2 nd place “A Tribute to Women art show”, Myrtle Beach, SC *3 rd place & Honorable Mention – Oil “Moja Arts Festival” Juried show, Charleston, SC *Honorable Mention oil “The Dog Show” Green-rice Gallery, Charlotte NC, Corporate collectors, Commissioned artwork Women's and Children's Hospital Union county, Monroe, NC Toll Brothers, Horsham, PA The Vue, Charlotte, NC Trust building, Charlotte, NC USG, Chicago IL Childress Klein YMCA, Charlotte, NC Builders design studio, Charlotte, NC UNCC, Charlotte, NC Lutheran retirement home, Albemarle, NC Hindu Center, Charlotte, NC Levine Children’s Hospital, Charlotte, NC Design Center, Matthews, NC Harris YMCA, Charlotte, NC Campus connections, Charlotte, NC Council Furniture, High Point, NC Bank of America Stadium, Charlotte, NC Mecklenburg Community Church, Charlotte, NC Ashes to Art – McColl Center for Visual Art, Charlotte, NC American Heart Assoc., Atlanta, GA Taste of Charlotte, Charlotte, NC American Heart Assoc., Charlotte NC Bank of America, Charlotte, NC TIFF-CREFF, New York, NY Forsyth Medical Center, Winston-Salem, NC The Palace Movie Theater, Cornelius, NC "Make a difference" Learning Center, Thousand Oaks, CA Artist statement As an artist, I work hard to create paintings that speak both to me and hopefully to others depicting some of the most beautiful places on earth that I have seen. I always hope to share what has inspired me to create each painting. The whole process begins by taking lots of photos of nature from my travels. Using these photos, I then work in my sketch books and do illustrations of the different elements. Rather than recreating the exact image, I try to carefully consider what inspired me to take the photos. My goal is to tell the story of the experience and the emotion that I felt while on location in each new painting that I create. This artwork represents: “Different Types of Movements and Textures in Nature.” Each painting is hand sculptured with different layers of textures and colors to show the depths nature has to offer. I create art because I must. Art exemplifies and substantiates my existence and is a necessary extension of my life. I want to initiate wonder and questions, intrigue and entertain the senses, while communicating my thoughts, dreams and desires.